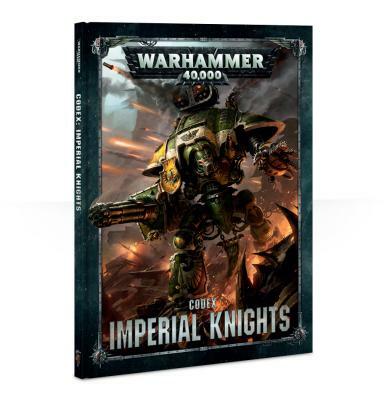 Codex: Imperial Knights contains a wealth of background and rules – the definitive book for Imperial Knights collectors. Within this 120-page hardback, you’ll find: - The story of the Imperial Knights, from the founding of the Knight worlds during Mankind’s first great exodus to the establishment of these towering engines of war as a symbol of colonial expansion, and their symbiotic relationship with the forge worlds of the Adeptus Mechanicus; - Background on the Questor Imperialis worlds, which vary enormously in appearance, conditions and even culture, but whose Noble houses will ally themselves in times of need; - Background on the Questor Mechanicus worlds, where Knight worlds have forged alliances with the Adeptus Mechanicus, offering their services in return for shared technology; - Knights At War: the time-honoured strategies and tactics that have ensured Knightly victories for millennia are detailed here, along with details of some Knight classes and descriptions of both Questor Imperialis and Questor Mechanicus Great Houses; - Illustrated examples of Questor Imperialis heraldry and its application, with background, mottoes and key heraldry for the following Houses: House Terryn, House Cadmus, House Griffith, House Hawkshroud, and House Mortan; - Illustrated examples of Questor Mechanicus heraldry and its application, with background, mottoes and key heraldry for the following Houses: House Raven, House Vulker, House Taranis, and House Krast; - The story of the Freeblade Knights, who wander alone amongst the stars – sometimes by choice, often due to being forsaken. This includes 7 illustrated examples; - Knight Worlds of the Imperium: a galactic map showing Knight worlds, forge worlds and Dark Mechanicum forge worlds; - A Tapestry of Glories: a timeline of battles and major events in the history of the Imperial Knights; - Background on each unit available to an Imperial Knight army; - A showcase of beautifully painted Citadel miniatures, with example armies featuring everything from individual images of models to battle scenes on terrain.